This jour­ney takes us to Kapolei Mid­dle School in Kapolei, Hawaii, where Lisa talks with Library Media Spe­cial­ist Car­olyn H. Kirio. Car­olyn: Alo­ha! Greet­ings from our 50th State! Locat­ed in the Pacif­ic Ocean, our state is made up of eight major islands and 124 islets, stretch­ing in a 1,500-mile cres­cent from Kure Island in the west to the island of Hawaii in the east. Most of the state’s res­i­dents live on Oahu, and near­ly ¾ of them reside in Hon­olu­lu, the state’s cap­i­tal. Kapolei Mid­dle School is locat­ed in Kapolei, a new­ly devel­oped sub­urb on the west side of the island of Oahu. Our school ser­vices 1,450 sixth to eighth graders and is a year-round mul­ti­track school. Car­olyn: Although it is not a recent change, our school is on a mul­ti­track year-round sched­ule. To accom­mo­date our large school pop­u­la­tion, our stu­dents are divid­ed into four tracks. This means that at any one time, three of the four tracks are attend­ing school while the fourth is on inter­s­es­sion (vaca­tion). Fur­ther­more, our instruc­tion­al cycle is a year-round edu­ca­tion (YRE) pat­tern which offers us an alter­na­tive way to con­struct the school cal­en­dar. The rota­tion sequence fol­lows a year-round 45⁄15 cal­en­dar where one track returns from vaca­tion and one track leaves every 15 days. Our teach­ers do not have a class­room to call their own because they con­stant­ly rotate into the room vacat­ed by the teacher leav­ing on inter­s­es­sion. The tran­si­tion is com­plet­ed in a sin­gle after­noon with the exchange of file cab­i­nets, instruc­tion­al sup­plies, and desks. After the dust set­tles, our school updates the room and phone lists to reflect the track change. Besides being very con­fus­ing and chaot­ic, you might be won­der­ing how this affects the library. Many times I attempt to do school-wide instruc­tion or ini­tia­tives. What would nor­mal­ly take a week to com­plete teach­ing all class­es stretch­es out to two or more based upon the num­ber of stu­dents who need to cycle through, as well as the inter­s­es­sion that occurs for the track. Because tim­ing is every­thing, I have enlist­ed tech­nol­o­gy to assist me in teach­ing. Using the strat­e­gy of flipped class­room instruc­tion, I cre­ate many lessons in mp4 for­mat and have them avail­able on demand through our closed cir­cuit and intranet sys­tem. The library has sev­er­al ded­i­cat­ed sta­tions that teach­ers can call up on demand. As time allows in their busy sched­ules, they can fit my lessons in through­out the day when it best fits with­in their course instruc­tion. Some of the most-viewed seg­ments include my lessons on bib­li­og­ra­phy instruc­tion, rec­og­niz­ing and avoid­ing pla­gia­rism, and book infomer­cials I cre­ate to get stu­dents excit­ed about dif­fer­ent titles in the col­lec­tion. Car­olyn: This year has been a roller coast­er as far as track­ing which books are trend­ing and which are not. Book-inspired movies and tele­vi­sion shows have influ­enced book bor­row­ing through­out the year. How­ev­er, once the pop­u­lar­i­ty of the show wanes, stu­dents quick­ly tran­si­tion back to the writ­ers who reli­ably cre­ate great reads. Nar­row­ing it down, the five authors and their series that remain con­sis­tent­ly pop­u­lar include Rick Rior­dan (Per­cy Jack­son and the Olympians, The Heroes of Olym­pus), Jeff Kin­ney (Diary of a Wimpy Kid), Rachel Renee Rus­sell (Dork Diaries), R.L. Stine (Goose­bumps), and Dar­ren Shan (The Saga of Dar­ren Shan/Cirque du Freak). Car­olyn: On a dai­ly basis I work as a lit­er­a­ture match­mak­er to pair stu­dents with poten­tial books that they will con­nect with and enjoy. Engag­ing stu­dents in con­ver­sa­tion, my goal is to dis­cov­er what their per­son­al inter­ests are and what top­ics they are pas­sion­ate about. Often­times I love to intro­duce stu­dents to Hawai­ian his­tor­i­cal fic­tion such as titles writ­ten by Gra­ham Sal­is­bury, who focus­es on sto­ry lines and com­mu­ni­ties set in dif­fer­ent parts of our state. Because char­ac­ters and set­tings are famil­iar, stu­dents can eas­i­ly under­stand and relate to his books. 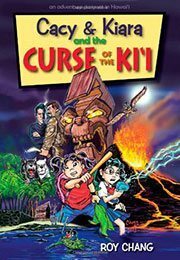 An excit­ing new book has recent­ly been on my rec­om­men­da­tion list: Cacy & Kiara and the Curse of the Ki‘i (Hawai­ian stat­ue or idol) by Roy Chang. Roy is the author and illus­tra­tor and has skill­ful­ly craft­ed an adven­ture set in a world where our main char­ac­ters inter­act with Hawai­ian myths and leg­ends. An inter­me­di­ate school fine arts teacher, Roy knows what inter­ests mid­dle school kids and cre­at­ed a hybrid man­ga and chap­ter book that is an instant draw. I hope that his sequel will be out soon because stu­dents can’t wait to revis­it Cacy and Kiara and embark on anoth­er jour­ney filled with Hawai­ian cul­ture and mythol­o­gy! Lisa: If you had a new staffer start­ing tomor­row, what piece of advice would you be sure to give them? Find the time to laugh and have fun! Car­olyn: No two days are ever the same! Stu­dents are filled with nev­er-end­ing ener­gy and ques­tions. They keep you con­stant­ly on your toes and think­ing out­side of the box. Giv­en the oppor­tu­ni­ty to grow and chal­lenge them­selves, they exceed expec­ta­tions and sur­prise you with what they can pro­duce. I laugh every day! It is such a weird stage in life for these kids, that if you can’t laugh with them, you will go insane. Mid­dle school­ers have the abil­i­ty to real­ly push them­selves, be inde­pen­dent learn­ers, and tap into their cre­ativ­i­ty and curios­i­ty. They are con­stant­ly ques­tion­ing who they are, dis­cov­er­ing what they can do, and test­ing where their bound­aries lie. As a teacher it can be excit­ing and frus­trat­ing at the same time. They are what they are, which is, in short, grow­ing up. Still chil­dren at heart, they can’t help but want to learn and play, so why fight them? Join them! Car­olyn: I have been a librar­i­an for 23 years. Dur­ing this time I have seen the phas­ing out of the card cat­a­log, flop­py disks, and micro­fiche. I have seen com­put­er stor­age increase from megabytes to ter­abytes, to archiv­ing in the cloud. The Inter­net has made the world a small­er place, offer­ing access to infor­ma­tion, resources, and experts from around the globe, and with a click, uni­ver­sal­ly trans­lat­ed into a famil­iar lan­guage that can be under­stood and com­pre­hend­ed by every­one. Recent­ly tech­nol­o­gy has pro­gressed and desk­tops have been replaced by the adop­tion of apps, mobile tech­nol­o­gy, and eBooks. Mid­dle King­dom read­ers have increased access to infor­ma­tion, and libraries are now open vir­tu­al­ly 24⁄7. With so much knowl­edge at their fin­ger­tips, it will be tru­ly amaz­ing to see what they dis­cov­er and how their curios­i­ty inspires this next gen­er­a­tion of learn­ers. 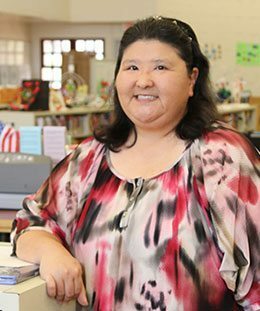 Car­olyn H. Kirio is a Library Media Spe­cial­ist at Kapolei Mid­dle School, where she trains, col­lab­o­rates, and instructs with teacher teams in project-based learn­ing work. She has pre­sent­ed at state and nation­al con­fer­ences and has coau­thored Col­lab­o­rat­ing for Project-based Learn­ing in Grades 9–12 (Lin­worth Pub­lish­ing, 2008). In 2006, the Amer­i­can Asso­ci­a­tion of School Librar­i­ans select­ed Kapolei’s library as one of the Nation­al School Library Media Pro­grams of the Year (SLMPY), and in 2015 award­ed Kirio with the Infor­ma­tion Tech­nol­o­gy Pathfind­er award. Kirio earned her Nation­al Board Cer­ti­fi­ca­tion in 2002 and 2011. She was select­ed as one of School Library Jour­nal’s “Top Ten Librar­i­ans To Watch” in 2003 and the Hawaii Asso­ci­a­tion of School Librar­i­ans also hon­ored Kirio with the Gold­en Key Award in 1999 for her exem­plary lead­er­ship in the school library pro­fes­sion. Kirio, a cur­rent PhD stu­dent in the Uni­ver­si­ty of Hawaii Col­lege of Edu­ca­tion Tech­nol­o­gy Pro­gram, has a BEd in Music Edu­ca­tion, a Pro­fes­sion­al Cer­tifi­cate in Sec­ondary Edu­ca­tion, and a MLIS in Library and Infor­ma­tion Sci­ence. This month we’re vis­it­ing Den­ver Acad­e­my in Den­ver, Col­orado, where Lisa talks with librar­i­an Jolene Gutiér­rez. Jolene: I’m the librar­i­an at Den­ver Acad­e­my, a school for diverse learn­ers from ele­men­tary through high school. Our school is locat­ed on 22 acres and we use the cam­pus as a learn­ing tool, from study­ing wildlife in our small pond to work­ing out math prob­lems in chalk on our side­walks. Our cam­pus start­ed as a tuber­cu­lo­sis hos­pi­tal in the ear­ly 1900s, so we have some beau­ti­ful his­toric build­ings, includ­ing the Chapel where my main library is housed (I also run a small High School Media Cen­ter in anoth­er build­ing). The Chapel is 90 years old this year and is des­ig­nat­ed as an his­toric land­mark in the city of Den­ver. We’re work­ing on a grant appli­ca­tion that will help us to pre­serve and restore cer­tain parts of the build­ing, includ­ing the cop­per cupo­la and the zinc-camed win­dows. I’ve done a lot of research over the past few years and have pulled that infor­ma­tion togeth­er into a web­site that my stu­dents use to cre­ate pre­sen­ta­tions and tours of the Chapel for their par­ents. Our school is com­prised of diverse learn­ers, which can mean lots of things. Some of our stu­dents are diag­nosed with things like dyslex­ia or ADHD, and some have no diag­noses but do bet­ter with small­er class sizes. Either way, many of our stu­dents have strug­gled before com­ing to Den­ver Acad­e­my, and I think that their strug­gles and some of the pain they’ve expe­ri­enced make them some of the most com­pas­sion­ate, respect­ful kids I’ve ever met. There’s very lit­tle bul­ly­ing on our cam­pus because most of the stu­dents know the pain of being bul­lied or feel­ing “less than,” and they don’t want oth­ers to feel that way. Our stu­dents are some of the most cre­ative peo­ple I’ve ever met. All of our stu­dents are bril­liant, and that bril­liance includes phe­nom­e­nal artists, gift­ed musi­cians, cre­ative writ­ers, and won­der­ful actors. Many of our alum­ni have gone on to make a liv­ing as actors, sculp­tors, and musi­cians. Some peo­ple say our library and oth­er parts of our cam­pus are haunt­ed. A group of our teach­ers lead a “Haunt­ed Den­ver” class each year, and the ambiance of our Chapel library cou­pled with those ghost tales have inspired many stu­dent movies and sto­ries. Jolene: I start­ed work­ing in my library over 20 years ago when we weren’t auto­mat­ed and I was writ­ing out over­due notices by hand. The tech­no­log­i­cal changes in the last 20 years have trans­formed both the way I man­age my library and the skills my stu­dents need to have when they grad­u­ate from our school. I do my best to keep up with teach­ing them what they need to know today as well as giv­ing them the crit­i­cal think­ing skills they’ll need in the future (because I have no idea where we’ll be in anoth­er 20 years)! Jolene: Dystopi­an fic­tion (espe­cial­ly that which has been made into movies like The Hunger Games, The Maze Run­ner, and The 5th Wave) has been very pop­u­lar this year, as have books by authors who’ve vis­it­ed our school recent­ly, includ­ing Avi’s Old Wolf and Bob­bie Pyron’s books Lucky Strike and The Dogs of Win­ter. And I know that’s six books, but I became a librar­i­an because I like words bet­ter than num­bers. Graph­ic nov­els are great for kids who have a tough time visu­al­iz­ing as they read because the pic­tures are pre-sup­plied. I also sug­gest graph­ic nov­els for the stu­dents who always ask for the nov­el­iza­tions of movies or books that movies are based on—these stu­dents may have issues with visu­al­iz­ing and pic­tur­ing things and might want to read about some­thing that they’ve seen visu­al­ly, like a movie. Movies are Cliff­s­Notes for kids who strug­gle with visu­al­iza­tion, and they often want to read some­thing they’ve already seen because they now have the images that go with the sto­ry. Choose Your Own Adven­ture and sim­i­lar books are won­der­ful for reluc­tant read­ers because they get to feel like they’re cheat­ing at read­ing (so are graph­ic nov­els and non­fic­tion books with lots of pho­tos). Now that there are so many CYOA-ish book series out there, stu­dents can find both non­fic­tion and fic­tion books, and when I show stu­dents that they can skip around and not real­ly read the entire book, they get real­ly excit­ed and a lot of them actu­al­ly end up read­ing most of the book because they try to get a pos­i­tive end­ing to their sto­ry. Series books give anx­ious stu­dents the answer to “What do I read next?” and help them to grow as a read­er as they work their way through each book in the series. Audio books and/or large print books allow stu­dents who strug­gle with print oth­er options for access­ing books. If stu­dents have a learn­ing dif­fer­ence, they can work on grow­ing their read­ing and com­pre­hen­sion skills in a less intim­i­dat­ing man­ner with these resources. Jolene: Some of our stu­dents don’t love books or read­ing, and that’s okay. We’re here to help them at least learn to like libraries and trust librar­i­ans. Teach­ing stu­dents to access libraries teach­es them a life skill. And once stu­dents begin to trust you, they may become more open to explor­ing books with you. There’s noth­ing more ful­fill­ing than find­ing the right book for a reluc­tant read­er. Often­times, there is that one mag­i­cal book that will unlock the world of read­ing for kids, and that is one of the most reward­ing parts of being a librar­i­an. If you can find that per­fect book, you can help change a life for­ev­er. Jolene: I want them to remem­ber the mag­ic of this space and the fun we’ve had here! I hope our library teach­es stu­dents the joy of learn­ing and books. I want our library to pro­vide some warm fuzzy mem­o­ries for stu­dents once they’re grown, and I hope my stu­dents’ good mem­o­ries of their library will cause them to be life­long library users. 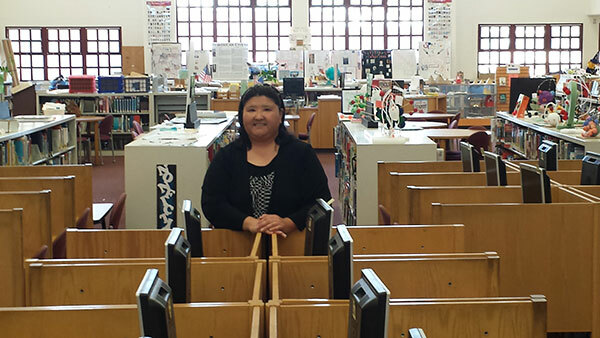 Jolene Gutiér­rez is a school librar­i­an at Den­ver Acad­e­my in Col­orado. She’s the recip­i­ent of Den­ver Academy’s Wings of the Future Life­time Achieve­ment award for 2015 and a young adult and children’s author who loves to con­nect kids with their just-right book. This jour­ney takes us to Gold­en­view Mid­dle School in Anchor­age, Alas­ka, where Lisa talks with librar­i­an Nicole Roohi. Lisa: Nicole, thank you so much for invit­ing us to make this vir­tu­al vis­it to your school library! Our first ques­tion is, what are three to five things our blog read­ers should know about your com­mu­ni­ty, school, or library/media cen­ter? Nicole: Gold­en­view Mid­dle School serves 700–800 sev­enth and eighth graders and is locat­ed in Anchor­age, Alas­ka. The Anchor­age School Dis­trict is the most deseg­re­gat­ed school dis­trict in the coun­try, and because of that we have an incred­i­ble diver­si­ty in each class­room, in race, lan­guage, cul­ture, and socio-eco­nom­ic sta­tus. The top three most diverse high schools in the coun­try are in Anchor­age, and six of the top sev­en most diverse mid­dle schools are also here. Although Gold­en­view is not one of these six, it can’t help but be incred­i­bly diverse as a result of being in this won­der­ful city. Nicole: Nat­u­ral­ly, all the dystopi­an trilo­gies are top­ping our cir­cu­la­tion list for the fall, fol­lowed by the movie tie-in books, so I’ll con­cen­trate on the next most pop­u­lar books after these usu­al sus­pects. That’s what makes it inter­est­ing, isn’t it? Intrigu­ing­ly, The List by Siob­han Vivian was hands down the biggest sin­gle book in cir­cu­la­tion this fall. I book talked it to one class, and then word of mouth made it spread like wild­fire amongst the sev­enth graders. A few days lat­er I noticed we had 14 holds on it, so I had to ILL sev­er­al copies from oth­er schools to fill the demand! The next four top books were Case File 13: Zom­bie Kid by J. Scott Sav­age, Ruby Red by Ker­stin Gier, Girl, Stolen by April Hen­ry, and Zero Tol­er­ance by Clau­dia Mills. Gracel­ing (by Kristin Cashore) is a favorite, and is an easy sell 95% of the time. Ash­fall (by Mike Mullin) is anoth­er easy sell, espe­cial­ly to boys. I like how the char­ac­ter matures. Some years, The Boy Who Har­nessed the Wind (by William Kamk­wam­ba and Bryan Meal­er) is very pop­u­lar, oth­er years not. This year it is cir­cu­lat­ing because some girls have read I Will Always Write Back (by Caitlin Ali­firen­ka and Mar­tin Gan­da with Liz Welch), or I Am Malala (by Malala Yousafzai with Christi­na Lamb) and want some­thing sim­i­lar, so I put this in their hands. The Thief (by Megan Whalen Turn­er) and The Raven Boys (by Mag­gie Stief­vater) are two of my favorite fan­tasies but are hard­er to sell. Gen­er­al­ly girls who love fan­ta­sy and romance will take them, and they come back gush­ing and tell their friends about them. We have a size­able Native pop­u­la­tion here, so The Absolute­ly True Diary of a Part-Time Indi­an (by Sher­man Alex­ie) is always pop­u­lar; it’s one of my favorites and is one I love to show kids. Whale Talk (by Chris Crutch­er) and Slam (by Nick Horn­by) appeal to boys once I point them out to them. Final­ly, The Dis­rep­utable His­to­ry of Frankie Lan­dau-Banks and even the Ruby Oliv­er series (all by E. Lock­hart) are ones I love to give out because they are, as my daugh­ter calls them, sub­ver­sive chick-lit. The girls get hooked on the romance and dra­ma, but they are quite empow­er­ing too. Prob­a­bly The Dis­rep­utable His­to­ry is too empow­er­ing as the girls hate that Frankie los­es her boyfriend in the end. I’m guess­ing high school­ers are much less dis­turbed by this end­ing. Nicole: When­ev­er I get a new library assis­tant, I tell them our first pri­or­i­ty is ser­vice. Also, you have to love kids and books. If you do, then this is the best job in the school. What could be bet­ter than help­ing stu­dents and staff every day? We make their lives bet­ter and eas­i­er and more fun! The best thing about this job is per­son­al­ly deliv­er­ing a book on hold to a student’s class­room and see­ing the excit­ed smile on their face. Lisa: What do you like most about work­ing with mid­dle-school­ers? Nicole: This age group is still young enough that they read all the time and home­work doesn’t inter­fere too much, so we still work with books a lot. But they are final­ly old enough that they are think­ing about the world around them and are try­ing to fig­ure out what their place is in it and how they can make a dif­fer­ence. So we get to talk about how to make the world a bet­ter place and I can help them find resources for that too. Lisa: Could you share some infor­ma­tion about your most pop­u­lar, suc­cess­ful, inno­v­a­tive pro­gram for pro­mot­ing books and read­ing to mid­dle school­ers? Nicole: There are lots of ways we pro­mote read­ing here. We just fin­ished the Amaz­ing Race, which is a dis­trict-wide read­ing com­pe­ti­tion among six of our mid­dle schools. Last year sev­er­al of the sec­ondary librar­i­ans decid­ed to gen­refy our fic­tion sec­tions to increase read­ing, and one of the things we did with that was to take our Amaz­ing Race com­pe­ti­tion and turn it into a way to encour­age our stu­dents to read in all sev­en gen­res. This year with all our stu­dents read­ing togeth­er, Gold­en­view read 3,268 hours in just 28 days! That is twice as much as we did last year. We also have video announce­ments every morn­ing, and I have been doing occa­sion­al record­ed book talks for many years. How­ev­er, last year we got a fan­tas­tic new announce­ments teacher, and we’ve worked togeth­er to improve the book talks. We now have Book Talk Tues­day every week, and the kids great­ly look for­ward to it. They often sing the book talk jin­gle to me when I pass them in the hall. Final­ly, I have for years cre­at­ed, curat­ed, and updat­ed a series of book pam­phlets on dif­fer­ent top­ics in our library. I have these on our cir­cu­la­tion desk and stu­dents take these every day to help them find books of inter­est. Of course now that we’ve gen­re­fied our fic­tion sec­tion, that helps them too! Nicole: In ten years I hope that my stu­dents still love to read. And I want them to see read­ing as a path­way to con­tin­ue their edu­ca­tion and growth for the rest of their lives. I very much would like to have them be strong pub­lic library users and sup­port­ers. Nicole Roohi is a mid­dle school librar­i­an in Anchor­age, Alas­ka. She has been a mid­dle school librar­i­an for ten years, and was an ele­men­tary librar­i­an for five years; four of those in North Geor­gia, the fifth at the sec­ond most diverse ele­men­tary school in the nation here in Anchor­age. She is a for­mer pres­i­dent of the Alas­ka Asso­ci­a­tion of School Librar­i­ans, and spends her spare time trav­el­ling around the state look­ing for Alas­ka (and John Green). So far, her gim­mick has failed in get­ting him to come vis­it. 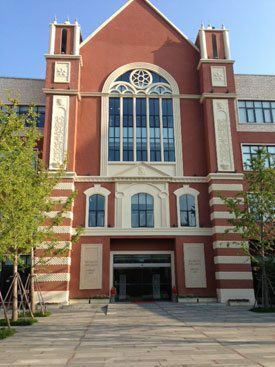 This month’s jour­ney takes us to Dul­wich Col­lege Suzhou in Suzhou, Chi­na, where Lisa talks with Head of Libraries and Senior School Librar­i­an Leigh Col­la­zo. Lisa: Right off the bat, I’ll clar­i­fy for our read­ers that in this case, “col­lege” means some­thing oth­er than how we use the term in the Unit­ed States. 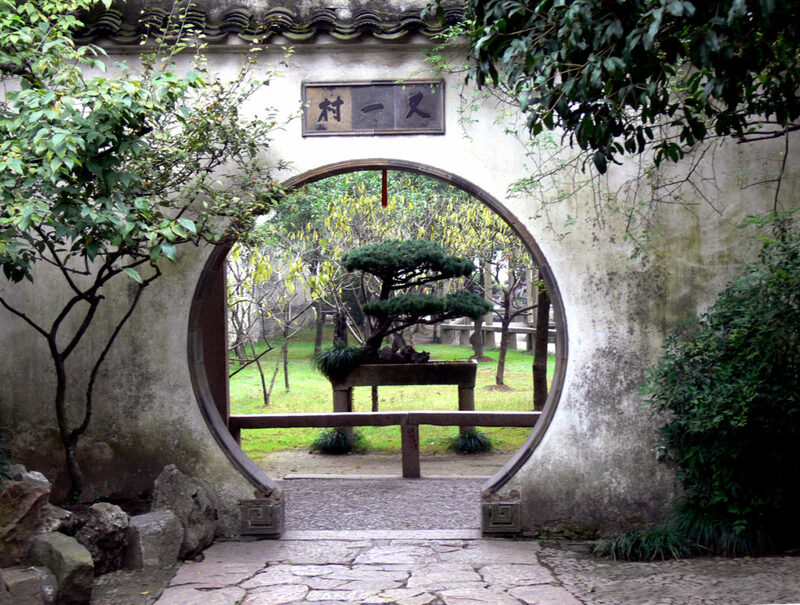 Dul­wich Col­lege Suzhou includes stu­dents ages 2–19. Leigh, what are three to five addi­tion­al things our blog read­ers should know about your com­mu­ni­ty, school, or library/media cen­ter? Leigh: Dul­wich Col­lege Lon­don was the first in our fran­chise, estab­lished in 1619. It has since expand­ed into Dul­wich Col­lege Inter­na­tion­al, which cur­rent­ly oper­ates five addi­tion­al schools and two inter­na­tion­al high schools in Asia. Dul­wich Col­lege Suzhou stu­dents and fac­ul­ty rep­re­sent over 40 nation­al­i­ties all over the world. Our largest groups come from UK, Korea, and the Unit­ed States. Our stu­dents are ages 2–19, sep­a­rat­ed into three schools: DUCKS (PreK-1st grade), Junior School (grades 2–5), and Senior School (grades 6–12). We have about 900 total stu­dents across the three schools. Though we do have very nice board­ing facil­i­ties avail­able, the vast major­i­ty of our stu­dents live off-cam­pus with their fam­i­lies. Suzhou is a beau­ti­ful Chi­nese city! We are locat­ed about 50 miles from Shang­hai, which is easy to access via a 25-minute bul­let train ride. Often called the “Venice of Chi­na,” Suzhou is most famous for its UNESCO World Her­itage gar­dens, water towns, Bud­dhist tem­ples, pago­das, and net­work of canals run­ning through the city. All over the city, we see beau­ti­ful wil­low trees, col­or­ful flow­ers, and lots of sculp­tures. There is a large recre­ation­al lake with a board­walk with­in a five-minute walk from my front door. The weath­er here is very like that of north­ern Flori­da: hot and humid in the sum­mer, cool (but still humid) in the win­ter. We get lots of rain, but it is rarely cold enough to snow. There are many expats from all over the world in Suzhou; I’ve heard the fig­ures are as high as 10% for­eign­ers in this area, most­ly from Europe, Aus­tralia, and the USA. We have two libraries at Dul­wich Col­lege, locat­ed in the Junior School and Senior School. We have full-time library employ­ees: two librar­i­ans (ful­ly-cer­ti­fied with MLS degrees), one library intern (who will receive her MLS this Decem­ber), and two library assis­tants. 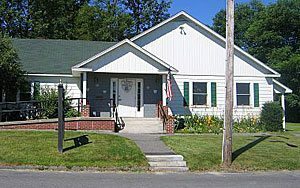 Togeth­er, our libraries boast a grow­ing col­lec­tion of 38,000 books and inter­na­tion­al news­pa­pers and mag­a­zines. Our libraries are open from 7:50 am-4:30 pm dai­ly. Both libraries have com­put­ers and iPads for stu­dents to use in the library. Both libraries have wire­less Inter­net, and Senior School stu­dents are also able to con­nect to the school’s VPN. We sub­scribe to many of the same data­bas­es I used in my Texas library—Encyclopedia Bri­tan­ni­ca, Peb­bleGo, JSTOR, Tum­ble­books, Brain­Pop, and Facts on File. I think many peo­ple would be sur­prised to hear that I have had few dif­fi­cul­ties with Chi­nese gov­ern­ment cen­sor­ship when pur­chas­ing library books. When we order (from the USA and UK), Cus­toms does inspect our pur­chas­es, but I have not had any books reject­ed. I am able to pur­chase the same books here that I was able to pur­chase in the USA, plus I can pur­chase books from Aus­tralia, UK, and Cana­da, too! Lisa: What recent changes or new ele­ments are affect­ing the work you do with mid­dle school stu­dents? Leigh: Last year was my first year at my school, and we spent a large part of the year gen­refy­ing the 15,000 fic­tion titles in our library. It’s been a huge hit with stu­dents and fac­ul­ty, and our over­all cir­cu­la­tion last year increased 89% over the pre­vi­ous school year. This year, I am thrilled to tell you that we are adding Over­drive e-books for all our Senior School stu­dents, which I expect to launch by the end of Sep­tem­ber. My library assis­tant has been work­ing on gen­refy­ing our 2,100-title Man­darin sec­tion, some­thing our stu­dents request­ed last year. We plan to gen­refy our Kore­an sec­tion this year as well, which is about 1,200 titles. In Novem­ber, we are bring­ing illus­tra­tor Matthew Holm (Baby­mouse series, Squish series) to Suzhou to speak to our stu­dents. We also have slam poet Nick Toczek vis­it­ing in Novem­ber. All of our mid­dle school stu­dents will get the chance to hear them speak. Last, we are par­tic­i­pat­ing in Bat­tle of the Books for the first time this year. We are using books on the Pan­da Old­er Read­ers Book List, plus sev­en more titles select­ed by par­tic­i­pat­ing librar­i­ans in the Shang­hai area. In March 2016, our stu­dents will com­pete against oth­er inter­na­tion­al schools from all over Shang­hai, Wuxi, Suzhou, and Kun­shan. They will also get to meet New­bery Award win­ning author Kwame Alexan­der at the com­pe­ti­tion. Lisa: What books do you per­son­al­ly love to place into mid­dle school stu­dents’ hands? Read the books! You can’t rec­om­mend them if you don’t read them. Be the weirdo. Be the crazy one who plays the spoons or break­dances or dec­o­rates the library with cat posters. Don’t be afraid to be your­self or be dif­fer­ent from the oth­er teach­ers. You are not them. You are you! Leigh: I love their ener­gy and their quirk­i­ness. They are old enough to do many things for them­selves, but they are still young enough to need guid­ance from trust­ed adults. I can joke around with mid­dle school stu­dents, and they (usu­al­ly!) get the jokes. Mid­dle school­ers can be chal­leng­ing some­times, but every day, they make me laugh, give me hope, and even help me see things in a dif­fer­ent way. Who else can say that about their job? Lisa: Could you share some infor­ma­tion about your most popular/successful/innovative pro­gram for pro­mot­ing books and read­ing to mid­dle school­ers? Leigh: I am a huge pro­po­nent of gen­refi­ca­tion of fic­tion sec­tions. Gen­refi­ca­tion bet­ter reflects the way stu­dents browse the library. Front-fac­ing library books (where the entire front cov­er is vis­i­ble) also real­ly helps stu­dents select books, as does mul­ti­ple themed book dis­plays. My favorite and most suc­cess­ful book pro­mo­tion tool is read­ing and book­talk­ing a LOT of titles. I book­talk all day long! After teach­ing sev­enth-grade Eng­lish for three years, Leigh Col­la­zo found her way into the library and nev­er looked back! Since 2004, she has opened three brand-new school libraries in Texas, both at the ele­men­tary and mid­dle school lev­els. In 2014, she and her hus­band Chris sold every­thing but their two kids and became inter­na­tion­al teach­ers in Suzhou, Chi­na. Leigh cur­rent­ly serves on the Pan­da Inter­na­tion­al Book Steer­ing Com­mit­tee, reviews YA books for School Library Jour­nal, and writes book reviews and arti­cles for librar­i­ans and teach­ers on her blog, Mrs. Read­er­Pants. She likes to roller skate, cro­chet, and ride huge roller coast­ers. She is cur­rent­ly on Lev­el 476 in Can­dy Crush. This month’s jour­ney takes us to Nebras­ka City Mid­dle School in Nebras­ka City, Nebras­ka, where Lisa talks with Media Spe­cial­ist Alice Har­ri­son. Lisa: What would you like to tell our read­ers about your com­mu­ni­ty? Alice: Nebras­ka City, Nebras­ka is home to the nation­al hol­i­day Arbor Day, cel­e­brat­ed every year the last Fri­day in April. J. Mor­ton Ster­ling, the founder of Arbor Day, migrat­ed to the Nebras­ka Ter­ri­to­ry in 1854, where he lat­er became the Sec­re­tary of Nebras­ka Ter­ri­to­ry. Ster­ling saw the agri­cul­tur­al and eco­nom­i­cal ben­e­fits of plant­i­ng trees, and in 1872 he con­vinced the Nebras­ka Board of Agri­cul­ture to estab­lish a spe­cif­ic hol­i­day for every­one to join in plant­i­ng trees. April was cho­sen to cor­re­late with Sterling’s birth­day, and sev­er­al pres­i­dents since then have declared Arbor Day a nation­al hol­i­day on the last Fri­day in April. 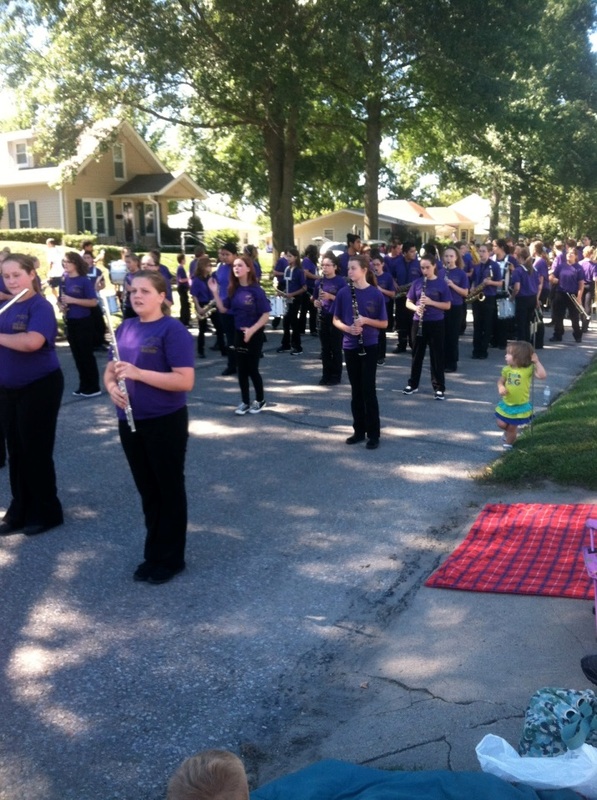 Since the first Arbor Day cel­e­bra­tion to the present day, Nebras­ka City has cel­e­brat­ed with a parade down the main street where area mid­dle school and high school bands come to per­form. 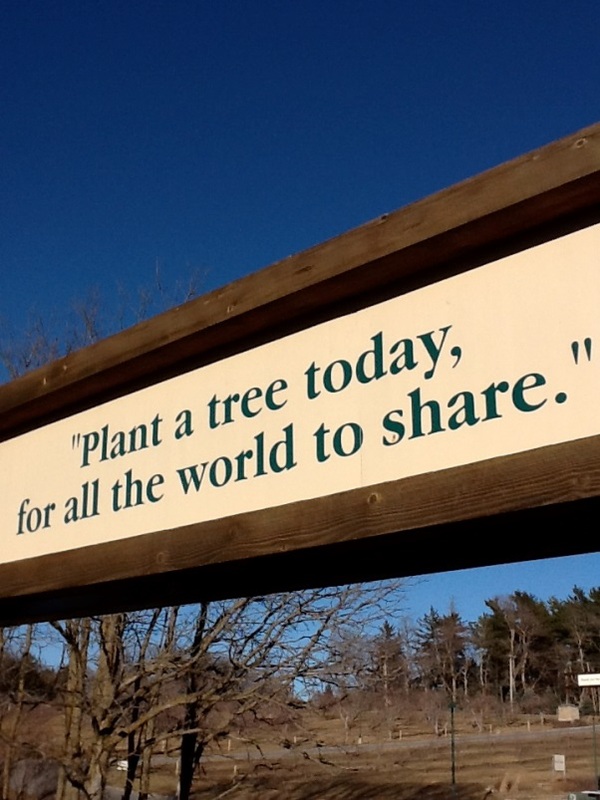 Tree starters are dis­trib­uted to the atten­dees, as well as tons of can­dy! The abun­dance of apple trees plant­ed in Nebras­ka City has led to anoth­er cel­e­bra­tion—the Apple­Jack Fes­ti­val was estab­lished to cel­e­brate the har­vest­ing of all those apples. Tak­ing place the third week­end in Sep­tem­ber, peo­ple come from all over to con­sume apple pies, apple bread, apple donuts (my favorite! ), sev­er­al vari­eties of fresh apples, apple jams, and a long list of oth­er apple items, along with par­tic­i­pat­ing in oth­er cel­e­bra­to­ry events. Lisa: What changes are ahead this year for your school or library/media cen­ter? 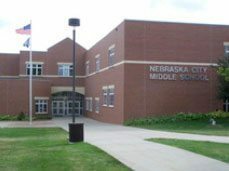 Alice: Nebras­ka City Mid­dle School has 325 stu­dents, pre­dom­i­nate­ly white with a large pop­u­la­tion of His­pan­ic stu­dents. It is a Title 1 school with 45.8% free and reduced lunch. The dis­trict school board passed the imple­men­ta­tion of a tech­nol­o­gy 1:1 ini­tia­tive, begin­ning the school year of 2015–16, as a pilot pro­gram in the Mid­dle School. All the stu­dents, staff, and fac­ul­ty will have Chrome­books to use (at school only) by check­ing them in and out of the home­rooms or alpha class­rooms. Present­ly, the Mid­dle School is the only school in the dis­trict approved to par­tic­i­pate in this pilot pro­gram. Every class­room teacher will be using Google Class­room (a Google Apps for Edu­ca­tion app). The goal is to help teach­ers save time by orga­niz­ing les­son plans, incor­po­rat­ing inter­ac­tive cur­ricu­lum, allow­ing for stu­dent and teacher col­lab­o­ra­tion, and pro­vid­ing imme­di­ate teacher feed­back, along with dis­play­ing and access­ing class assign­ments and grades. To incor­po­rate this 1:1 ini­tia­tive, our IT direc­tor is set­ting up every stu­dent with their own per­son­al Gmail account. To teach dig­i­tal cit­i­zen­ship and per­son­al respon­si­bil­i­ty with the Chrome­books, every teacher, includ­ing myself, will be teach­ing and uti­liz­ing the Com­mon Sense Media cur­ricu­lum. I am only a ¼-time Media Spe­cial­ist at the Mid­dle School (I teach at the ele­men­tary school for the oth­er ¾-time), so I am for­tu­nate to have a mar­velous full-time assis­tant in the Mid­dle School library. The first few days of school this com­ing year, all the stu­dents will be attend­ing train­ing ses­sions taught by the fac­ul­ty and staff to instruct stu­dents in the use and care of Chrome­books. In the past, I have taught 6th grade key­board­ing, but to date, I do not know of any plans for key­board­ing instruc­tion. 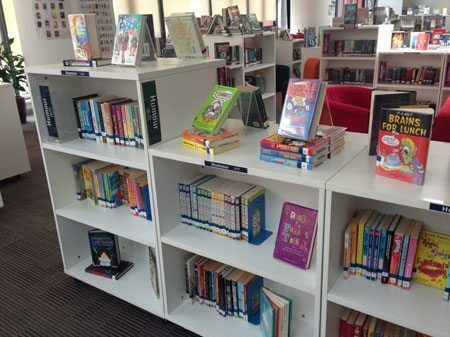 Lisa: What else will be new for the Mid­dle School library this year? Alice: I am excit­ed­ly antic­i­pat­ing this new school year at the Mid­dle School because this past May I pur­chased 37 e-books, our first time to acquire this for­mat. The e-books that I pur­chased were from Fol­lett, but our library auto­mat­ed sys­tem is the online, cloud-based ver­sion of Library World. Fol­let sent me detailed instruc­tions as to how to set up the e-books for check­out. The stu­dents and fac­ul­ty will be able to read the e-books on the Chrome­books, but only online. How­ev­er, they can be accessed on all oth­er devices for online or offline read­ing. I’m ecsta­t­ic! 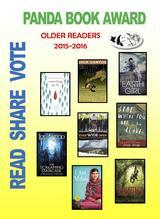 Six­teen of the e-books are our state award nom­i­nees, which are called Gold­en Sow­ers . There are a total of 30 books nom­i­nat­ed every year for three lev­els, with 10 nom­i­nat­ed in each lev­el: Pri­ma­ry, Inter­me­di­ate, and Young Adult. And that leads me to how I came to con­nect with Lisa Bullard, who asked if I would par­tic­i­pate in this inter­view for Bookol­o­gy—her book Turn Left at the Cow is a Gold­en Sow­er nom­i­nee for the 2015–16 school year. Lisa: Alice, the Gold­en Sow­er nom­i­na­tion is such a huge hon­or for me, and I’m so delight­ed that it brought the two of us togeth­er! Can you tell us more about the impact of the Gold­en Sow­er titles on your library and stu­dent read­ing? Alice: Each sum­mer, I try to read as many Gold­en Sow­er nom­i­nees for the com­ing school year as I can. READING…my favorite pass-time! 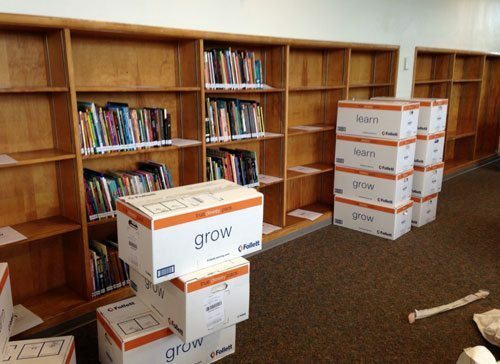 As you can imag­ine, a major con­cen­tra­tion of our pro­mo­tion at the Mid­dle School library is devot­ed to the Gold­en Sow­er state nom­i­nee books. Our literature/reading teach­ers also heav­i­ly pro­mote these in their class­rooms. At the end of every school year, the stu­dents are award­ed cer­tifi­cates for four dif­fer­ent lev­els of com­ple­tion for read­ing the Gold­en Sow­ers. From these stu­dents, three names are drawn for addi­tion­al prizes. Some of the Gold­en Sow­er nom­i­nees are books from a series—then I usu­al­ly pur­chase the whole series, because the stu­dents are so inter­est­ed in the nom­i­nat­ed books. For exam­ple, some of the series with recent Gold­en Sow­er nom­i­nat­ed-titles are: Richard Paul Evans’ Michael Vey series, the Starters series by Lis­sa Price, Rob Buyea’s Mr. Terupt titles, the Accord­ing to Humphrey books by Bet­ty G. Bir­ney, Suzanne Collins’ Hunger Games series, and the Leg­end series by Marie Lu. Two years ago, Won­der, by R.J. Pala­cio, was cho­sen as a Gold­en Sow­er Award win­ner and our Mid­dle School select­ed this book as an all-school read. Lisa: What oth­er books and series have been pop­u­lar reads in your Mid­dle School? Alice: The list includes the Diver­gent series by Veron­i­ca Roth, the Con­spir­a­cy 365 series by Gabrielle Lord, the Selec­tion series by Kiera Cass, Erin Hunter’s War­riors series and Seek­ers series, the Ascen­dance Tril­o­gy by Jen­nifer A. Nielsen, and the Cirque du Freak series by Dar­ren Shan. Oth­er pop­u­lar authors with our mid­dle school­ers are Mike Lupi­ca, Lau­rie Halse Ander­son, Meg Cabot, and Carl Hiaasen. Lisa: I’m amazed at all you have going on—especially since with your split sched­ule, you don’t have a lot of time to do it all! Are there any oth­er ini­tia­tives you’d like to share? Alice: In the past year, I have been try­ing to focus more on our reluc­tant read­ers in the Mid­dle School. I’ve been pur­chas­ing more non­fic­tion graph­ic read­ers and fic­tion graph­ic nov­els. Also, this new school year I am incor­po­rat­ing a new pro­mo­tion at the Mid­dle School for the Gold­en Sow­ers. I have been mak­ing audio and print­ed text QR codes for each Gold­en Sow­er book and print­ing the book cov­ers to apply them to the cov­ers. I will be dis­play­ing them in the Mid­dle School library and hall­ways. The audio por­tion fea­tures me read­ing the book’s sum­ma­ry, and the print­ed por­tion con­tains links to book trail­ers, author web­sites, and book theme links. This month’s jour­ney takes us to East Junior High in Shakopee, Min­neso­ta, where Lisa talks with media spe­cial­ist Amy Sticha. Amy: East Junior High is one of two junior high schools in Shakopee, Min­neso­ta, a rapid­ly grow­ing sub­urb of the Twin Cities. Because of our district’s growth over the past sev­er­al years, we have gone through a lot of recon­fig­u­ra­tion of grade lev­els at all of our build­ings. Cur­rent­ly, our junior highs house stu­dents in grades 7–9, but with the pas­sage of a ref­er­en­dum to build an addi­tion to our high school a few weeks ago, we will be chang­ing to grades 6–8 by 2018. As a result of all this shuf­fling, the EJH library has been split twice in the last eight years to accom­mo­date oth­er schools’ libraries. It has been chal­leng­ing to main­tain a rel­e­vant col­lec­tion with the loss of so many mate­ri­als, but thanks to a sup­port­ive admin­is­tra­tion and com­mu­ni­ty, we are in the process of adding tech­nol­o­gy like medi­as­capes, charg­ing tables, Chrome­book carts, and 1:1 iPads, and updat­ing our district’s media cen­ters to add mak­er­space areas and oth­er spaces to stay cur­rent with­in the chang­ing scope of a school library/media cen­ter space. I invite you to vis­it my media web­page. Amy: Pro­mot­ing read­ing is prob­a­bly one of my favorite things to do as a junior high media spe­cial­ist. In addi­tion to book talks and dis­plays, my para and I work close­ly togeth­er to come up with a vari­ety of fun and inter­ac­tive read­ing pro­mo­tions through­out the year. We use Face­book and Twit­ter accounts to announce con­tests, spe­cial events, and updates about new books or what we are cur­rent­ly read­ing. 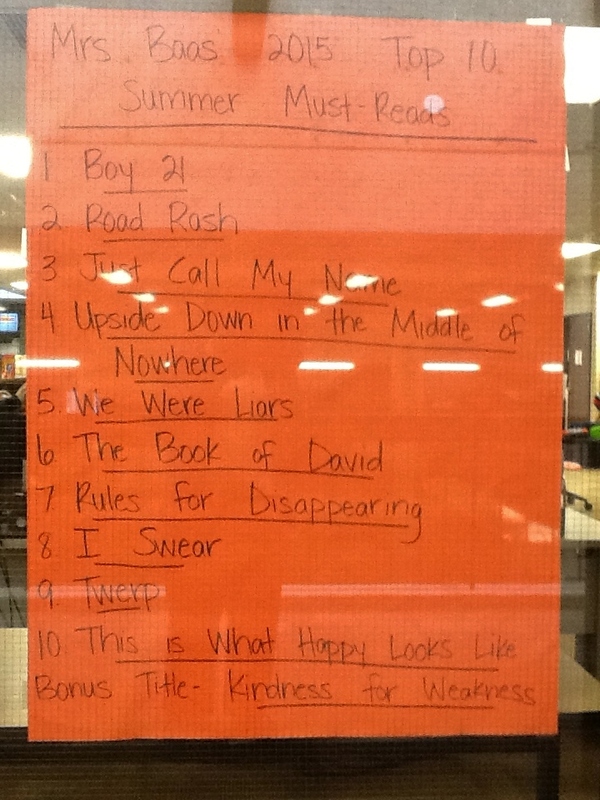 I actu­al­ly just fin­ished putting up my favorite dis­play of the year, which is our Top 10 Sum­mer Must-Reads and is made up of my para’s and my favorite books we have read through­out the year and would sug­gest for fun sum­mer read­ing. Both stu­dents and staff mem­bers around the school make com­ments about our lists every year. Sev­er­al times over the last few hours today, I have looked up from my desk to see some­one tak­ing a pic of our lists with their phone. 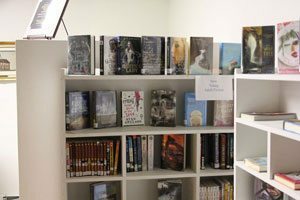 Every month, we have a stu­dent book club that is led by a dif­fer­ent staff mem­ber. At the begin­ning of each year, I ask for staff vol­un­teers who would be inter­est­ed in lead­ing the club for one of the months of the school year. In prepa­ra­tion for the upcom­ing month’s book club, the staff mem­ber and I decide on which book they would like to choose, and stu­dents who par­tic­i­pate get a free copy of the book and free break­fast at the two meet­ings held dur­ing the month. Some months have bet­ter par­tic­i­pa­tion than oth­ers, but over­all, it is a fun way to show stu­dents that staff mem­bers read for plea­sure out­side of school, too. We also have a Tour­na­ment of the Books every March to coin­cide with the NCAA bas­ket­ball tour­na­ments. Thir­ty-two books take on each oth­er in our annu­al tour­na­ment to see which one is cho­sen by our stu­dent body to be the ulti­mate win­ner. This year’s win­ner was The Lost Hero by Rick Rior­dan. This year for the first time, we had a spring break read­ing com­pe­ti­tion dur­ing which we encour­aged stu­dents to take pics of them­selves read­ing in unique, strange, fun, or inter­est­ing places. Our over­all win­ner took a pic of him­self read­ing in front of a moun­tain range while vis­it­ing his grand­par­ents in Ari­zona. This year we also par­tic­i­pat­ed in the Young Adults’ Choic­es project spon­sored by the Inter­na­tion­al Lit­er­a­cy Asso­ci­a­tion and were intro­duced to a num­ber of real­ly great titles! We have a great time pro­mot­ing read­ing to EJH stu­dents! Amy Sticha is a farm girl at heart, hav­ing grown up on a farm and ranch in south­west North Dako­ta. There were 17 kids in her high school grad­u­at­ing class. She taught high school Eng­lish before get­ting her degree to become a media spe­cial­ist. Her favorite thing to do when she has free time is read, espe­cial­ly young adult fic­tion and his­tor­i­cal fic­tion. This month’s jour­ney takes us to the Hart­land Pub­lic Library in rur­al Maine, where Lisa talks with librar­i­an John R. Clark. Lisa: What are three to five things Bookol­o­gy read­ers should know about your com­mu­ni­ty or library? John: Hart­land is very rur­al, eco­nom­i­cal­ly depressed, and isn’t close to any city with a book­store. That means the library assumes a much larg­er role in terms of offer­ing access to juve­nile fic­tion than a city like Port­land or Boston. We’ve tried to address this in cre­ative ways, like swap­ping books online at Paper­Back Swap, using rev­enue from books sold online to add to the col­lec­tion, and trad­ing with oth­er librar­i­ans in Maine when we get recent dupli­cates. Maine is big in size, but very close in terms of library coöper­a­tion. It helps immense­ly that we have a statewide inter­li­brary loan van ser­vice. That makes encour­ag­ing younger patrons to feel com­fort­able using inter­li­brary loan an easy process. Lisa: I’ve heard that you’re retir­ing, so I have a cou­ple of con­nect­ed ques­tions I real­ly hope you’ll address giv­en your valu­able in-depth per­spec­tive: How have books for mid­dle king­dom read­ers changed dur­ing your tenure in the library? And have the types of books that read­ers this age ask for changed in any key way? John: There has been a major shift in both juve­nile and young adult fic­tion, par­tic­u­lar­ly in the past few years. I attribute this to two things. First, J.K. Rowl­ing stood the pub­lish­ing indus­try on its ear and sud­den­ly every­one real­ized that there was one heck of a mar­ket for books that involved fan­ta­sy and kids who weren’t ‘aver­age.’ The sec­ond was 9⁄11. I don’t think adults (except for writ­ers and librar­i­ans, maybe) had a clue how scary that made the world for every­one. Escape into books became a very healthy and pop­u­lar part of life. In the past few years, we have seen a sec­ond wave begin, that of address­ing all sorts of social/mental health/family issues in lit­er­a­ture. This is more pro­nounced in young adult, but things like divorce, gay par­ents, sib­ling loss, and bul­ly­ing are being addressed, very excel­lent­ly I might add, in juve­nile lit­er­a­ture. In fact, one of my blogs at Maine Crime Writ­ers recent­ly was about this phe­nom­e­non, which I think is a hip ver­sion of what we used to call bib­lio­ther­a­py when I worked in the men­tal health field. Kids have respond­ed very well to these books and I read them myself because I enjoy see­ing how dif­fer­ent authors address the top­ics. Juve­nile read­ers have respond­ed to these new top­ics and I often see them come in and ask specif­i­cal­ly for a book a friend read that they think will be inter­est­ing because of some­thing going on in their life. Lisa: What five books (or series) are checked out most often by read­ers in the Mid­dle King­dom age range? Lisa: What book(s) do you per­son­al­ly love to place into mid­dle school read­ers’ hands? Lisa: If you had a new staffer start­ing tomor­row, what piece of advice would you be sure to give them about work­ing with read­ers in this tran­si­tion­al age? John: That’s easy, read in the genre if at all pos­si­ble because you can’t beat real, first­hand expe­ri­ence when it comes to talk­ing about books with teens and tweens. John: Sev­er­al years ago, I won a street-legal ver­sion of Kasey Kahne’s Dodge from Gillette. It includ­ed a trip to meet Kasey at the Citizen’s Bank 400 in Michi­gan. The staff of the pro­mo­tion com­pa­ny was real­ly inter­est­ed in my sum­mer give­away pro­gram for kids who read. 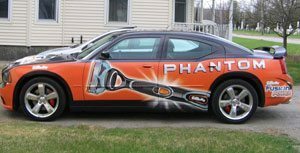 They got var­i­ous NASCAR dri­vers and teams to send me a ton of posters, shirts, and ban­ners to use as read­ing incen­tives. I added in a bunch of stuff like MP3 play­ers and new DVDs we’d got­ten for Pep­si points and we gave away over $1,000 worth of prizes for a com­bined read­ing and writ­ing pro­gram. Kids were beyond thrilled. Our first jour­ney takes us to Jane Addams Mid­dle School in Seat­tle, Wash­ing­ton, where Lisa talks with librar­i­an Lau­rie Amster-Bur­ton. Lisa: What are three to five things Bookol­o­gy read­ers should know about your com­mu­ni­ty, school, or library/media cen­ter? New book col­lec­tion get­ting unpacked in August 2014 (click to enlarge). Lau­rie: Jane Addams Mid­dle School is a new mid­dle school in an old-ish (1949) build­ing. We serve all kinds of stu­dents in grades six-eight, includ­ing pro­grams for Eng­lish lan­guage learn­ers, high­ly capa­ble, and autism inclu­sion. Our staff is ener­getic and our stu­dents are live­ly. 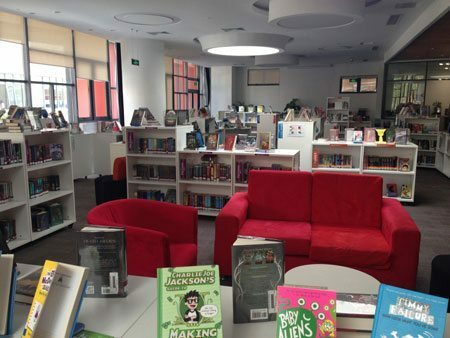 The library opened this year with 10,600 brand-new books. Lau­rie: Graph­ic nov­els or comics are 11 of the top 20 books checked out, and Raina Tel­ge­meier is the reign­ing queen. Her books Sis­ters, Dra­ma, and Smile are in con­stant cir­cu­la­tion. Pop­u­lar series include the Menagerie books by Tui T. Suther­land, Diary of a Wimpy Kid by Jeff Kin­ney, and the Dork Diaries series by Rachel Renée Rus­sell. 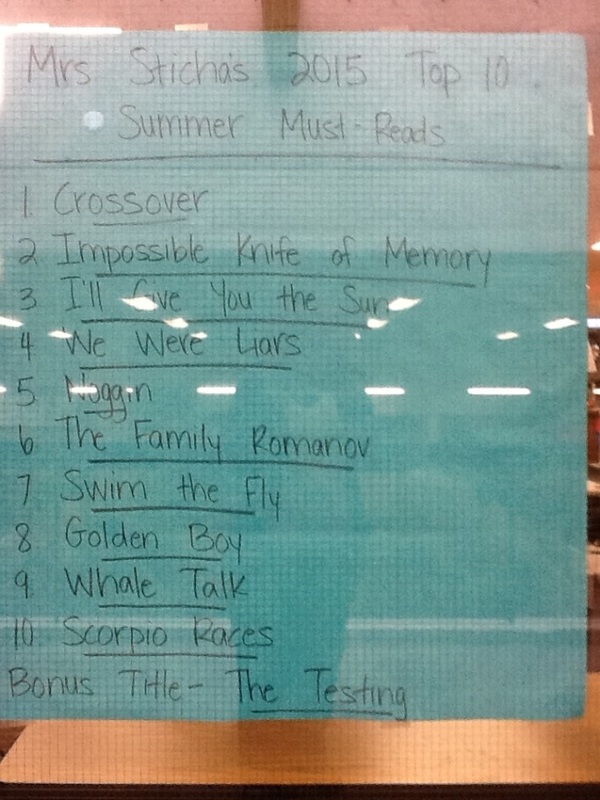 You can see that those titles skew toward the sixth grade read­ers. The books most pop­u­lar with old­er stu­dents include The Liv­ing by Matt de la Pena, the Maze Run­ner series by James Dash­n­er, The Fault in Our Stars by John Green, and Eleanor & Park by Rain­bow Row­ell. Lisa: What books do you per­son­al­ly love to place into stu­dents’ hands? Lau­rie: Ship Break­er by Pao­lo Baci­galupi. Good Enough by Paula Yoo. Impos­si­ble by Nan­cy Wer­lin. Zach’s Lie by Roland Smith (wit­ness pro­tec­tion!). Girl, Stolen by April Hen­ry (kid­nap­ping!). Con­fet­ti Girl by Diana Lopez. Bliz­zard of Glass by Sal­ly M. Walk­er is amaz­ing non­fic­tion that I love to book­talk. Our library has the new edi­tions of Lois Dun­can, and when I get them into kids’ hands they always come back for more. Lau­rie: Be calm. Be patient. Show the kids that you care. Lau­rie: They are so fun­ny and earnest and thrive with a lit­tle kind­ness. Lau­rie Amster-Bur­ton is a mid­dle school librar­i­an in the Seat­tle School Dis­trict. She believes that every school library would ben­e­fit from hav­ing more cook­books.